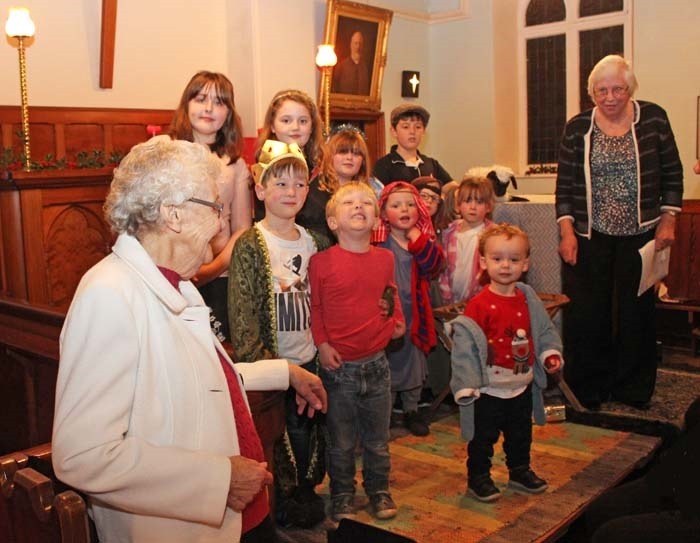 Above: Jean Cockburn (in the foreground) and Rona Trowell with the children who participated in the Aysgarth Chapel Nativity this year. Christmas won’t be quite the same in Aysgarth without its annual children’s nativity at the Methodist Chapel. 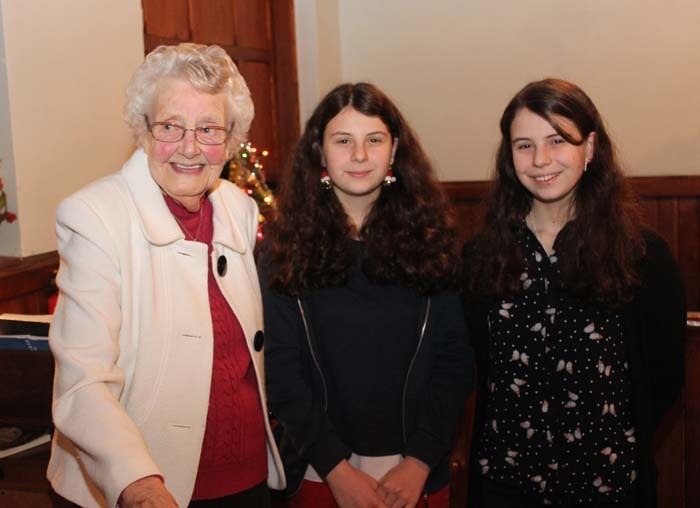 With the chapel due for closure in 2019 the last nativity was held on Sunday December 9. A few days later I sat with Jean Cockburn (92) as she searched both her father’s diaries and her own to pinpoint exactly when she started organising this very special community event. Finally we found her notes in November and December 1966 about the rehearsals for the first nativity play in the chapel. By then she had already been running the Sunday School for four years. “I used to go to Kendal to buy suitable plays as there was a nice little religious bookshop there,” she told me. It was pointed out at this year’s nativity that the parents of several of the children taking part had also previously participated in the plays – and some of the grandparents too. 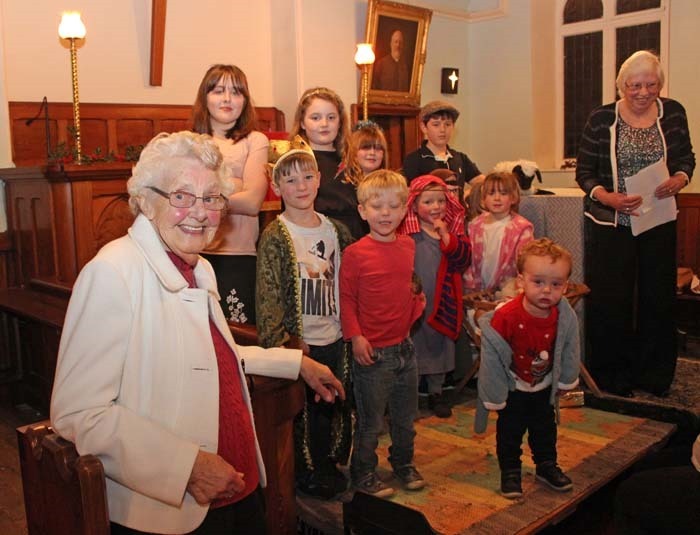 For the past 25 years Rona Trowell has helped to organise the chapel’s Nativity event. Both she and Jean were thanked by Frank Trowell. In recent years Rona and Jean have introduced some very creative changes to the nativity story adapting it to the abilities of the children taking part. This year’s was a very good example with the older children (Charlotte, Thomasina, Abigail and George) providing the narration and impressing everyone with their singing. The younger children (Sebastian, Douglas, Aidan, Lily-Anne, Jacob and Will) had great fun enacting the arrival of the nativity characters. The congregation also thoroughly enjoyed the instrumental solos by Amy and Sophie. Andrew Souter accompanied the carol singing on the organ. The collection of £160 was shared between the charities Action for Children and Children in Need. Below top: One little shepherd comes out of hiding!